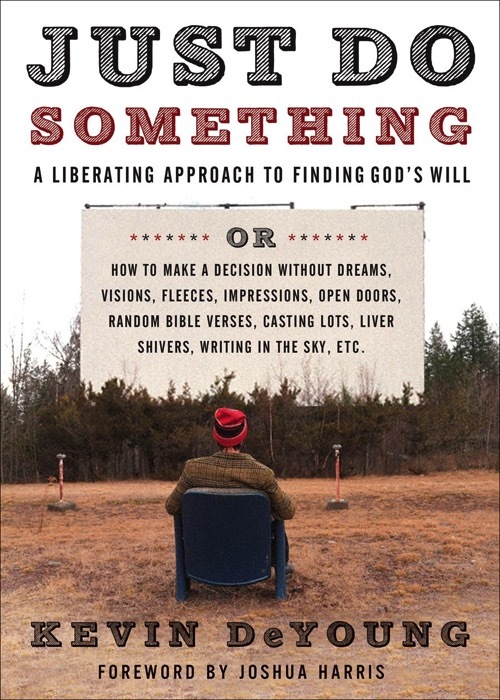 This book's full title also serves as its introduction: Just Do Something: A Liberating Approach to Finding God's Will. Or, How to make a decision without dreams, visions, fleeces, impressions, open doors, random Bible verses, casting lots, liver shivers, writing in the sky, etc. This is typical of Kevin DeYoung's style which is forthright to the point of being blunt. His topic is one that requires urgency, however: the paralysis of many Christians who feel they don't know God's will for their lives and are therefore on-hold until they get further revelation. He writes with a pastor's concern/frustration that I recognise. Often when I speak to people about making decisions they have an assumption that God's will is a tightrope that can be easily fallen from; or that they are faced with countless doors, of which only one is the right one. This is instinctive to many of us, and reinforced by general Christian culture. DeYoung examines this thinking robustly, pointing out its faults and showing a better way to understand God's will and our lives. "God has a wonderful plan for your life – a plan that will take you through trial and triumph as you are transformed into the image of His Son (Romans 8:28-29). Of this we can be absolutely confident. But God’s normal way of operation is not to show this plan to us ahead of time – in retrospect, maybe; in advance, rarely." As someone who believes in the work of the Holy Spirit through spiritual gifts today, I would disagree somewhat with his suggestions in chapter 6 that the descriptions of guidance in Acts are not at all normal (though he presents a more balanced perspective than others would). Several of the key life decisions I've made have been significantly shaped by personal prophetic words so I would not discount them or discourage people from seeking them. Where I do agree with him is that these words could never veto what the Bible says, and that they should always be considered prayerfully and in community. I often have decisions justified to me with the dreaded phrase, "God said to me..." As DeYoung points out, this is the end of all discussion and accountability, both of which are commended by God in His word as key to wisdom. Many of us we need to think through what "walking by faith" means. DeYoung's presents it as a lifestyle of always listening to God (through reading His Word, praying, taking counsel, and - I would add - eagerly desiring prophecy) whilst getting on with doing good unhindered by indecision. This book is brief and to the point. I found much to cheer here, and I will be encouraging people to read it in the hope that the paralysis of analysis and the tyranny of "God said..." will feature less prominently in our lives, to be replaced with wisdom and seeking first God's Kingdom.